Today I realized that it has been almost a month since I posted here. Wow, it seems like just a week or so. School, family, and music have been keeping me busy, and recreational writing is the first thing to go when I have so much required reading and writing to do. I am learning some new languages (French, ChucK, and Max/Msp) right now, and it is taking up lots of time. The good news is that my French friends can understand my French, and today I got Max and ChucK to talk to each other, so things are going well on those fronts. I’ve been playing lots of good music too, which makes everything else easier to deal with. Last weekend I got to play with Joe McPhee and Michael Zerang (along with Rob Cambre, Donald Miller, and Bhob Rainey), and it was great. Joe and Michael did a duo show Thursday night, which was wonderful, and having the chance to play and hang with them Friday night was a musical and personal highlight. I had every intention of blogging in detail about my great weekend at the Chicago Jazz Fest, but that’s not going to happen. There have been some good play by plays in other places, and google can help you find those. – The folks in Chicago do their jazz fest right. It is exceedingly well programmed, and the people seem to really appreciate it. -George Lewis is super bad…in the good way. The trio with Muhal Richard Abrams, Roscoe Mitchell, and George Lewis is an absolute don’t miss. If you get the chance to hear them, don’t miss it. -I got to hang with my cousin Matt, which was very cool, and he came out to hear the Lucky 7s. He even wrote about the experience. 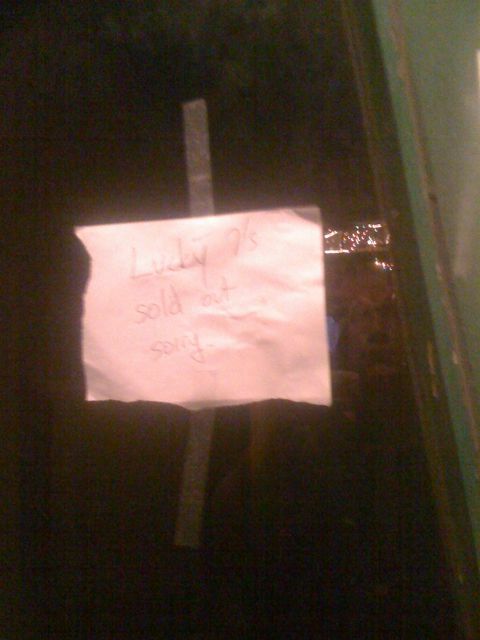 -This sign was seen on the door at the Lucky 7s gig on Sunday (the last night) of Jazz Fest. I love Chicago. On August 29th, the Jeff Albert Quartet played a midnight show at Snug Harbor. The earlier shows featured John Ellis and Double Wide. That same night, Ken Vandermark was playing in NY with Nasheet Waits, Jason Moran, and Eric Revis. I made a little deal with Matt that I would live tweet the John Ellis show, and he would live tweet the NY show. He did, I didn’t, and now I owe him a blog post on the night. A brief aside about live tweeting first. It is really hard to form and transmit coherent 140 character thoughts while listening to music. I’m still not sure if I think that level of intellectual processing while an audience member makes the experience better or worse. Ok, John Ellis’ band is fun to listen to, and they throw down. 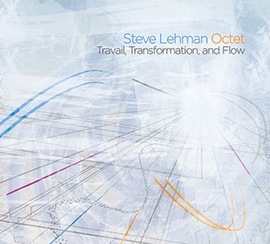 The rhythm section of Jason Marsalis (drums), Matt Perrinne (sousaphone), and Brian Coogan (organ) has the rare ability to get groovy-party-space and pushing-towards-abstraction-space to peacefully co-exsist. It is tough to make one move body parts and be musically surprised simultaneously. These guys can do that. The front line consisted of Ellis on tenor sax and bass clarinet, Alan Ferber (trombone) and Gregoire Marét (harmonica). The material makes good use of the timbral possibilities of that combination. Marét is super underrated. He takes the very cool sound of the harmonica and uses it to make wonderful modern sophisticated exciting music. The band recorded a new CD in the days after this performance, so be on the lookout for that. In other news, Lubricity had a post on language used to identify music and musicians. Alex had issues with the word “jazzer.” I get his point. Any time a word is used as a way to limit someone else, that gets problematic. I would have no problem trying to expunge “jazzer” from my lexicon. The term that really sets me off however is “legit,” when offered as the alternative to “jazz.” If one thing is described as legit (legitimate), inherent in that description is the idea that the thing not being described is illegitimate. If I say “get the brown shirt,” you know that the other shirt is not brown. Some argue that “classical” is an inaccurate term when describing non-jazz because it is also used to describe a particular historical period and style. I say that record stores and music marketers would not use a term that is vague or leads to uncertainty. If it is good enough for Barnes and Noble, it has to be better than legit. Others argue that no slight is meant when they use the term “legit.” Regardless of one’s intention, the word has a pretty specific meaning. Again, if I call the brown shirt “orange” and then say, “well you all know what I mean, and I’m not intending to insult the brown shirt, I just like to call it orange because I am too lazy to adjust my usage to better reflect reality,” I am still using the word “orange” incorrectly. So there’s the short version of my word rant…I’ll have to reword all of my jazzer and legit guy jokes, and that will be ok.